No flood insurance required at this fabulously renovated waterfront home! Since 2014 this home has undergone a complete renovation including: New metal roof, new pvc plumbing, new dual zone ac, new heated pool and spa, new kitchen, new hurricane rated windows and doors, new spray foam insulation, new duct work, new driveway, new irrigation system, new well, new sod and landscaping, new fence, new composite dock with electric, new wiring and circuit panel, new bathrooms. This home is concrete block with new hardy plank siding (concrete based material) and is basically a new home. You'll enjoy an open great room plan with lots of natural light. It is a split plan with 3 bedrooms, 3 bathrooms plus half bath, and a bonus room/den that can be turned into a fourth bedroom with the addition of a closet. The current owners keep a variety of boats at the dock including the 32' boat seen in these photos. 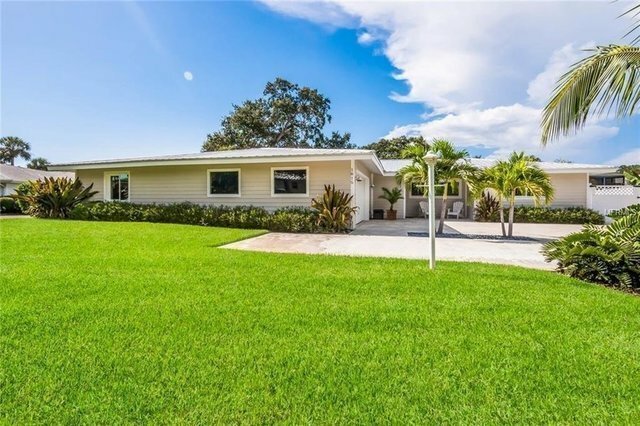 With no bridges to the bay and just 5 homes from open water this is the ideal setting for the boating enthusiast. The community features a voluntary HOA with membership giving you access to the community boat ramp and sunset park. This is the ultimate in mainland waterfront living!